YOUR DAILY BLEND is a unique way to incorporate your daily requirements of vitamins and minerals with yummy, refreshing smoothies. Your Personal Trainer LLC is excited to offer our workout clients this exclusive nutritional solution. YOUR DAILY BLEND is a unique way to incorporate your daily requirements of vitamins and minerals with yummy, refreshing smoothies. The plan is easy to follow—drink one 11oz. plant-packed smoothie 3 times a day, before each meal, followed by your normal meal choices. Each smoothie offers 3 servings of vegetables and one serving of fruit, more than your recommended daily requirement of nutritious, fresh fruits and vegetables. 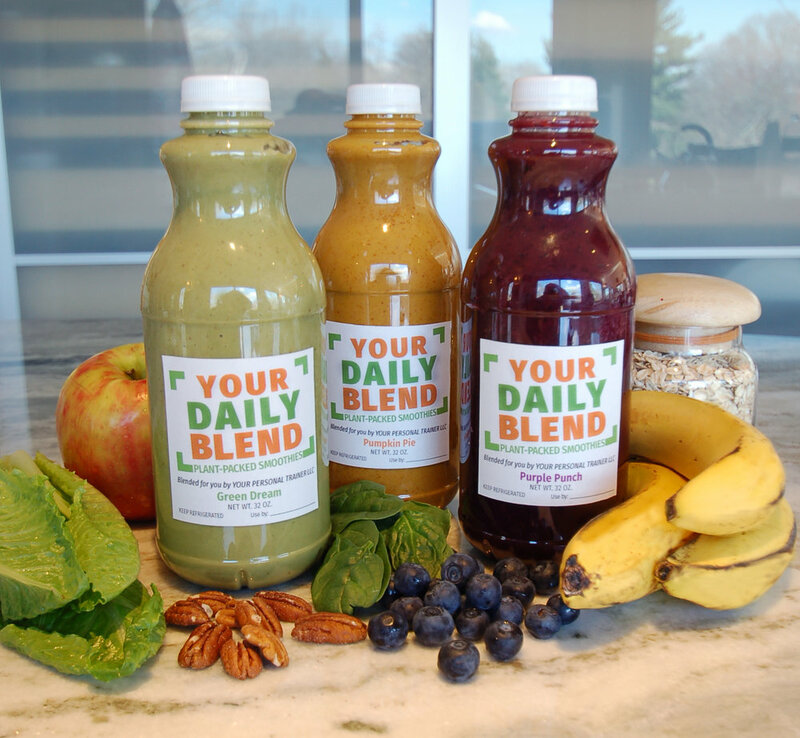 YOUR DAILY BLEND smoothies are fresh, filling, and satisfy your food cravings before a meal. As a result, you will find that during the day you consume less unhealthy foods which are being replaced with nutrient-rich plant foods. Smoothies are hand-blended with care and delivered to you twice a week. They contain no additives and only natural ingredients. Ingredients are primarily organic and packaged in safe, plastic, recyclable containers. 8 Flavors: Green Delicious, Chocolate Banana Pudding, Purple Punch, White Muscle, Omega Orange, Prime Peach, Apple Ginger and Pumpkin Pie.